Take a big bowl add flour, sugar, salt, baking soda, nuts and raisins and mix well. Beat the eggs or if you are using egg beaters, mix it in a bowl adding vanilla extract, yogurt, melted butter and the mashed bananas. Add this mix to the flour in the big bowl and mix thoroughly. Take a flat pan, grease it with butter and dust with all purpose flour. Fill the mixed batter in the pan and bake for 60-70 minutes at 375F in the conventional oven. (Preheat the oven to 350F). Check if the cake is well done by inserting a tooth pick in to the cake at the centre. If it comes out clean then the cake is done. Switch off the oven, take the cake out and cool it. Then cut in to pieces. You can store and use this yummy banana bread for 3 – 5 days. 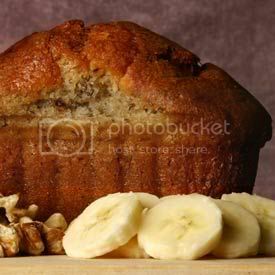 Banana bread is a sweet bread made with a butter that is full of mashed bananas, ground cinnamon and toasted nuts. Some may also have chocolate in them. It is very fast and easy to make, and it tastes great. Banana bread is easy to make and delicious.